The paterns and colours can and do vary quite a lot in normal ball pythons. Also if anyone can give some advise, when I got him he had quite a bit of old shed stuck on his tail. After soaking him in warm water the shed came off however the tip of his tail is a little bit raw. Should I just leave it to heal up on its own or is there something I can buy to put on the raw area. The area that is raw is literally only the tip, about 1mm squared. Still wouldn't want that to manifest into something worse. If it will make you feel better, take a little bit of "Betadine" or "dermadine" mix it with a little bit of water and dab the raw area with cotton. 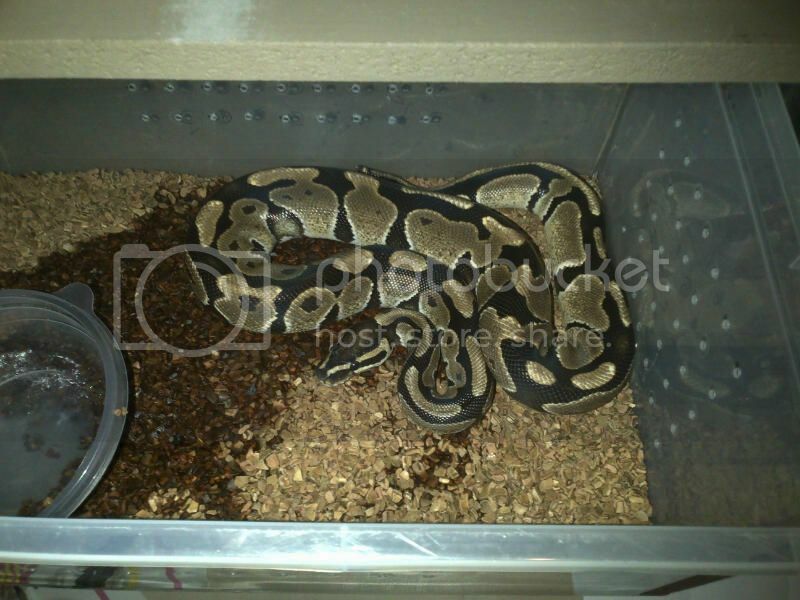 Remove all the substrate and put the guy on news paper and leave the guy alone for a week, ball pythons have the tendency to take a while to settle in. Put him on news paper as soon as I got him. Other substrates require too much effort to keep clean :P He seems to be settled in quite well, going to try feed him tonight.